The significance of Walt Disney’s legacy is its ability to affect and influence people in different ways. One can take away certain meaning from various aspects of his character, career, and life, and interpret it differently. Peek…, a designer children’s clothing boutique, acknowledges Walt’s legacy and the timelessness of his own words and designs and have translated that through fashion. 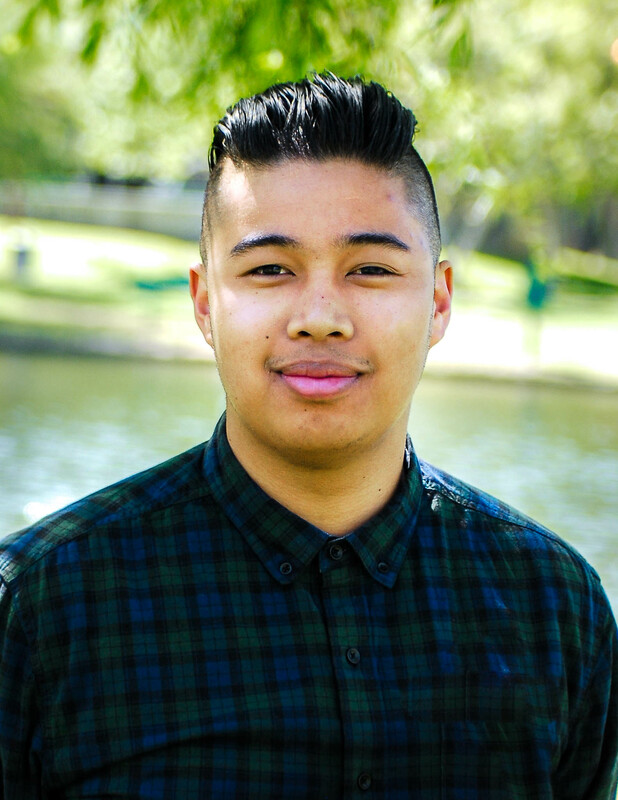 Peek… is a designer clothing store for children that prides itself in promoting positivity and expression with designer clothing. This is not only evident in the apparel they offer, but also the atmosphere and setting they present whether it be inspirational quotes on the wall or the employees’ outgoing interaction with their little customers. Tina Canales, the CEO behind Peek…, started the company in hopes to create a place that could provide clothes that had “sophistication and quality that was still kid appropriate.” Sophistication and kid-friendly definitely define their brand and look; from the classy and refined style they provide to the monkey bars and picnic table that decorate their shop, both adults and kids alike will be satisfied. It certainly is great to see a brand that genuinely expresses a deep compassion for children. So it was only fitting that a like-minded company like Disney wanted to partner in creating something magical! 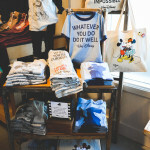 The results are a new, exclusive line of t-shirts that display the aura of who Walt Disney and Mickey Mouse were all about – the essence of Disney. 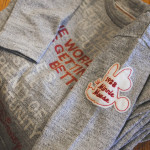 The shirts were inspired by quotes by Walt and older depictions of Mickey we all know and love from years past. “We started with the quotes from Walt and we took the Mickey and Minnie images from the 1928 Steamboat Willie, which is the first time they were introduced, because we thought they were very authentic and cool and kind-of vintage,” Canales said. In addition to the inspiration found in the visual imagery, designers also found inspiration in Walt Disney’s “Walt-isms”. 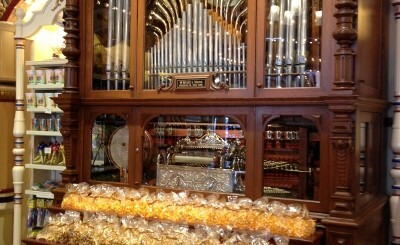 Canales continued “We found that we shared a lot of the same values and we spoke to kids the same way…” Walt’s quotes like “It’s kind of fun to do the impossible” and “When you’re curious, you find lots of interesting things to do” really brings the saying of ‘being a kid at heart’ to life. Minnie Mouse Short-Sleeve Tee: A short-sleeve ringer t-shirt in red heather featuring the vintage full-color 1928 Minnie Mouse design on the front and a Minnie Mouse silhouette on the back together with “It’s kind of fun to do the impossible” quote from Walt Disney. Priced at $34 for girls and $28 for baby girl. Minnie Mouse Long-Sleeve Tee: A long-sleeve heather gray heavy-weight cotton t-shirt with a classic Walt Disney quote on the front, “Believe in the future, the world is getting better, there is still plenty of opportunity” and vintage water-based red silhouette of Minnie Mouse on the back. A white felt patch, inspired by the iconic Mickey Mouse ears hats from the Mickey Mouse Club of the 1950’s, is of a 1928 Minnie Mouse silhouette with red stitching on the sleeve. Priced at $42 for girls and $38 for baby girl. Mickey Mouse Short-Sleeve Tee: A blue heather short-sleeve ringer t-shirt featuring the simple, yet powerful Walt Disney quote, “Whatever you do, do it well” on the front and a navy blue, water-base soft graphic silhouette of classic 1928 Mickey Mouse on the back. Priced at $24 for boys and $28 for baby boys. 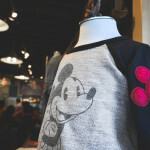 Mickey Mouse Long-Sleeve Tee: A heavy-weight heather gray t-shirt, with raglan baseball-jersey-style long black sleeves, features a line-drawing of classic Mickey Mouse on the front. The quote, “When you’re curious, you find lots of interesting things to do,” by Walt Disney is on the back in black, white and red block text. A red felt patch of a 1928 Mickey Mouse silhouette on the sleeve, sewn with red and white stitching, highlights the design. The “1928” used on the patch honors the year Mickey and Minnie appeared in “Steamboat Willie,” the short film directed by Walt Disney, often considered the debut of Mickey Mouse and his girlfriend Minnie Mouse. Priced at $42 for boys and $38 for baby boy. Peek… has 18 stores located throughout the United States, such as: Miami, Chicago, Denver, Dallas, Houston, Seattle, Denver, and Santa Monica. They can also be found at Nordstrom. You can find the new Disney Collection in their stores or online on their website by clicking HERE. Are you going to buy clothes from their new Disney Collection from Peek…? 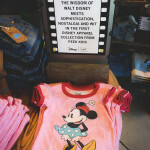 Do Walt Disney’s words of wisdom resonate with you and for your kids who’ll wear the shirts? Let us know in the comments!